Unprecedented changes in technology and global business are providing more opportunities for enterprises than ever before, but they are also placing significant stresses on legacy data centers. When it comes to enterprise storage, in particular, many organizations are grappling with outdated storage models that contribute to complexity, high costs and, ultimately, diminished results from infrastructure modernization initiatives like virtualization, cloud and even virtual desktop infrastructure. 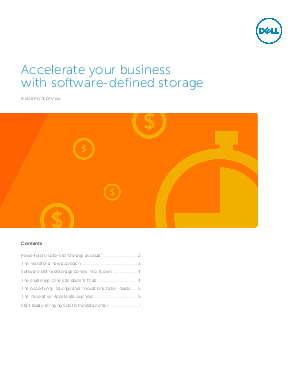 Software- defined storage (SDS) is emerging as a promising way to drive greater storage agility and efficiency. However, organizations often find it difficult to activate SDS within the constraints of “one size fits all” approaches or the uncharted paths of “do it yourself” systems.